true, I wasn't familiar. However, I'd choice to spec a bike with a longer head tube, and fewer spacers, but it's your face. That's great if you're buying custom but as I'm sure you know, you can't "spec" head tubes on off the shelf frames, but what you can do is purchase the proper components, like the correct fork and dial in the fit, which I did and my face is just fine thanks and the bike fits fine and ride great. why not run a stem with 17 degree (or more) rise, and eliminate some spacers? Less tech talk, more photos! Not the best shot due to the extreme backlight but the only shot we've ever had of ourselves before, during or after a ride. 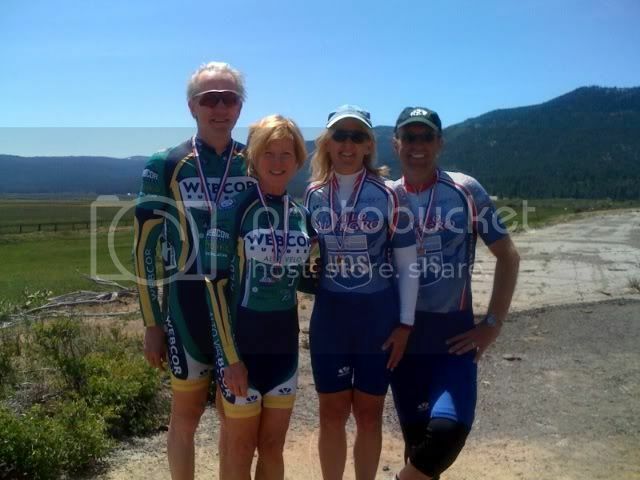 This is the finish line of the '08 Reach The Beach ride in Oregon. Begins in Portland and ends at the beautiful Oregon coast with a tire dip in the surf. Beatiful bike and look at the legs on you two! Nice picture! Having some trouble figuring out how to submit a pic hopefully this works. 9% for 1.25 miles winery on top, it worked out. Where is that, US or Europe, inquiring minds want to know... Nice shot. Hahn winery, Monterey county. Tired legs wanted wine! sans tandem, but one of us together on a ride. Next year we plan on giving you guys a run for your money as we will be in your category. Let's do the math - the 110+ tandem combined age category - sweet - that must mean that since Red Rider and I are only 39, you and Hermes must be at least 71! You guys look pretty darn good! We are going to try that TT next year. 25+27 = 52.... I guess that's.. uh... open class?? That would make you and RR the trophy brides. "We are going to try that TT next year. 25+27 = 52.... I guess that's.. uh... open class??" You young whippersnappers have no respect. [/I]You young whippersnappers have no respect. I have much respect. I really hope to see you guys on the northern cal. coast ride in a few weeks. That is awesome you guys!! 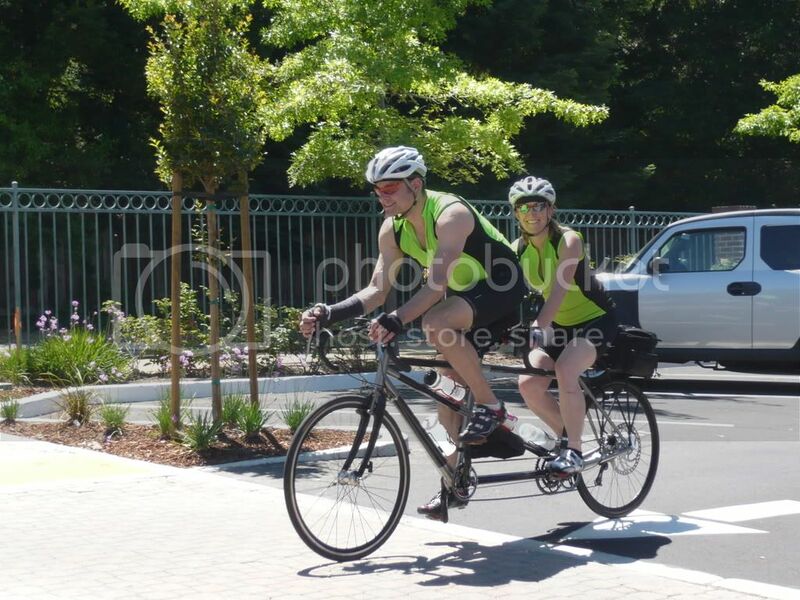 A recent photo by Evergreen Tandem Club photographer Barb Angell. Near-vintage Kuwahara (with previous Reynolds single-bike all-carbon fork, recently swapped out for a Wound Up tandem fork). Trudy is in back. And a picture from last year on a trip to - well, I'll let y'all figure it out... - L.
Last edited by lhbernhardt; 07-29-08 at 08:58 PM. 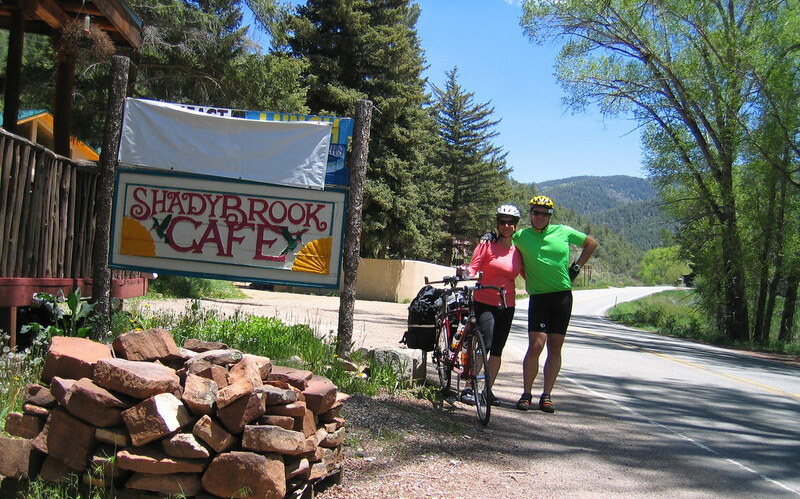 Near the end of the Enchanted Circle loop coming into Taos, New Mexico. What a great ride. This is a pic of us after finishing this year's BAK (Biking Across Kansas). The Missouri Rivr is running at near capacity in the background as you can see. Feel sorry for all you Iowa folks!